PaloAltoPhoto.com is the web site of Allen Edwards Photography, a Sole Proprietorship located in Palo Alto, California. Allen is dedicated to offering high quality artistically composed bird and nature photography. He received his first SLR camera over 40 years ago and has been taking pictures every since. After working in high tech for 30 years, he now enjoys focusing his creative energy on Photography. I hope you enjoy the new site. Many thanks to my lovely daughter for doing the design. Please look around the site and let me know what you think. 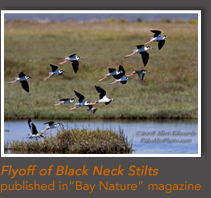 The latest news is that one of my pictures has been selected to be published in "Bay Nature" Magazine. Please click on the thumbnail below to see a larger version. You may notice that I have replaced the shopping cart with a direct email from you to me. If you would like to purchase a copy of my work, click on the "Order" button and fill out the linked order form. Every item is custom printed so special orders are not a problem - just indicate what you want in the comment section of the order form if the size is not shown on the price list. Phone me if you prefer.